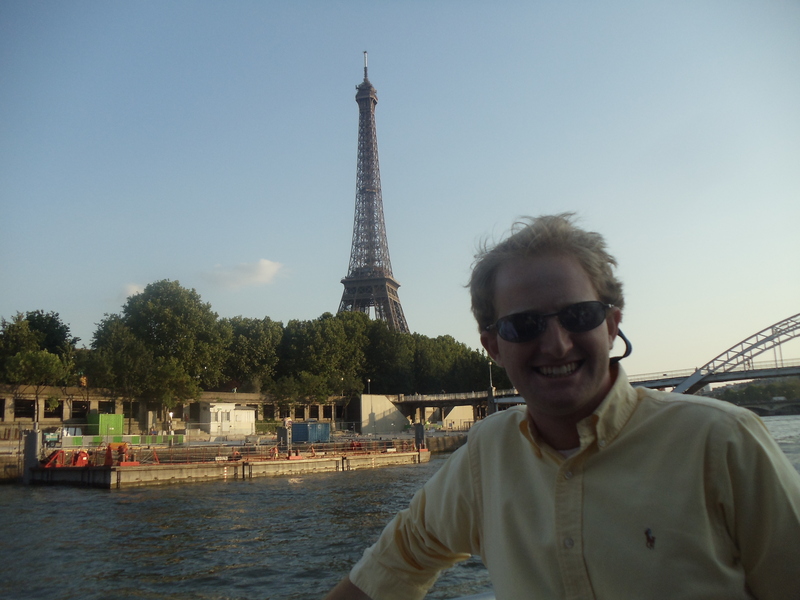 I visited Paris twice this summer, and let me tell you, both times were extraordinary. 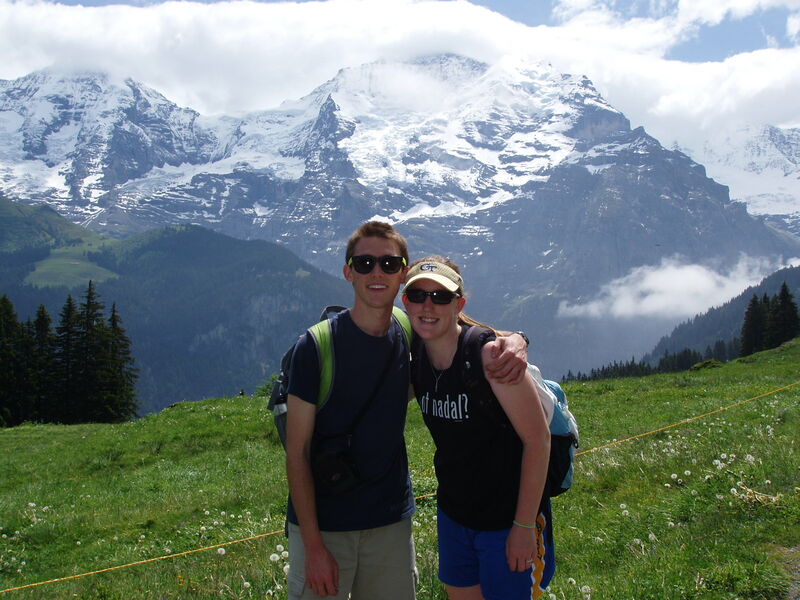 The first trip was the weekend of June 7th – 9th. 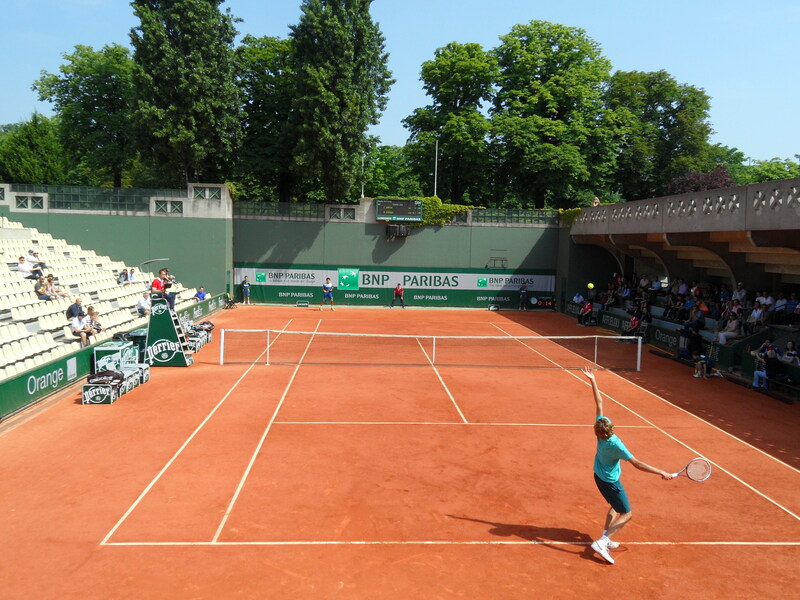 The primary reason for that Paris trip was none other than the Roland Garros (the French Open). 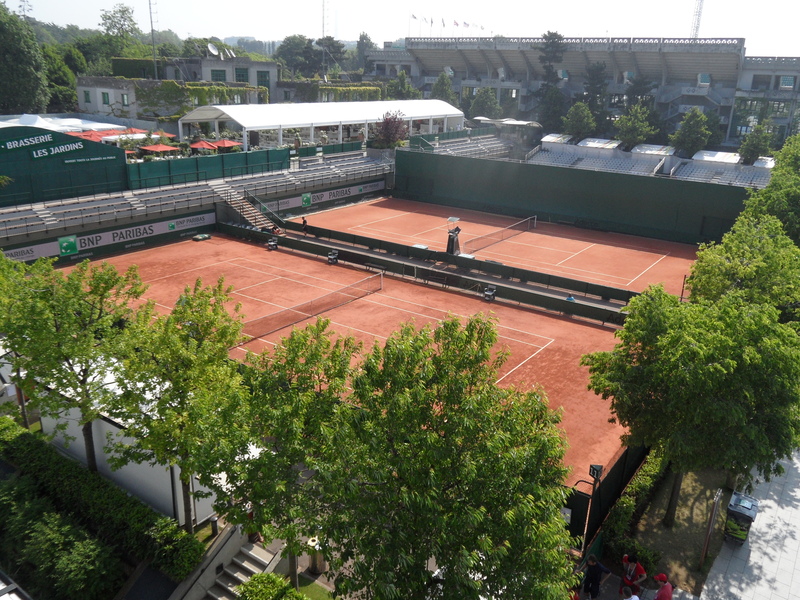 Some of my friends and I purchased grounds passes for the French Open Tennis Tournament for Saturday the 8th, which included admission to any court except for Center Court. 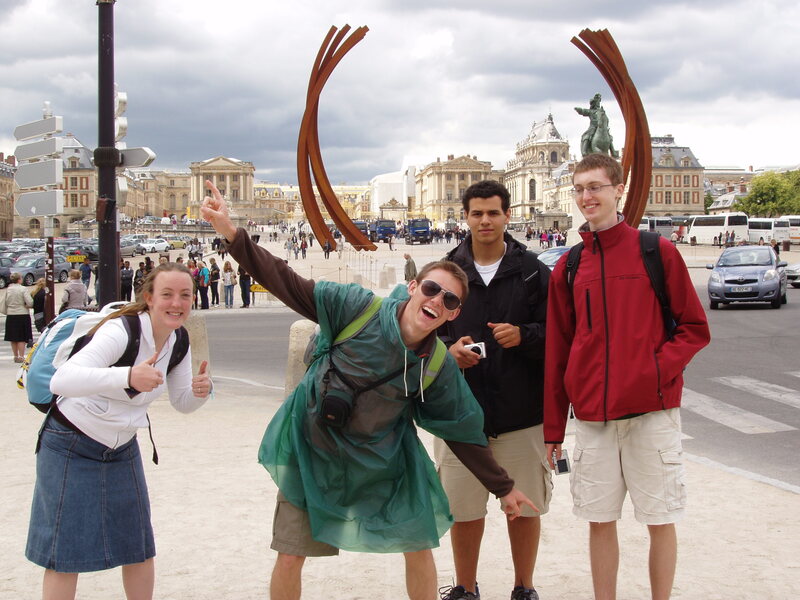 After the French Open, my friends and I toured some of Paris’s more popular tourist attractions, such as the Eiffel Tower, the Versailles Palace, and the Arc de Triomphe. As the sun rose over Paris, my group made its way to the tournament. Paris’s metro system is complex, which may seem confusing at first, but incredibly efficient in transporting people all throughout the city. This was helpful, since the tennis tournament is held in the southwest corner of Paris, opposite of the hostel at which we were staying. After navigating the underground, we made it to the tournament and walked through the gates like children in a candy shop. It was early, so the park wasn’t too crowded yet. Even so, it was exciting to see ball boys walk around and tennis pros warming up on the smaller courts. We thought we saw David Ferrer hitting, but alas, it was another Spaniard-looking tennis player with long hair. We made our way throughout the park, taking pictures all the while. We climbed to the top of Court 2’s stands to get a view and snap some photos, then worked our way to the Junior Men’s Singles Final. Juniors means they were 16 years or younger. These kids did not look 16. They looked at least 20 and wow, were they good at tennis. It was incredible to watch such a high level of play from such young players in person. After the match, we shopped and got souvenirs and presents for family, then experienced an Andre Agassi sighting! We all gawked and took pictures of the tennis playing celeb. After our paparazzi phase wore off, we walked through the Roland Garros museum. It was informative and academic, exploring the history, development, and other neat aspects of tennis. 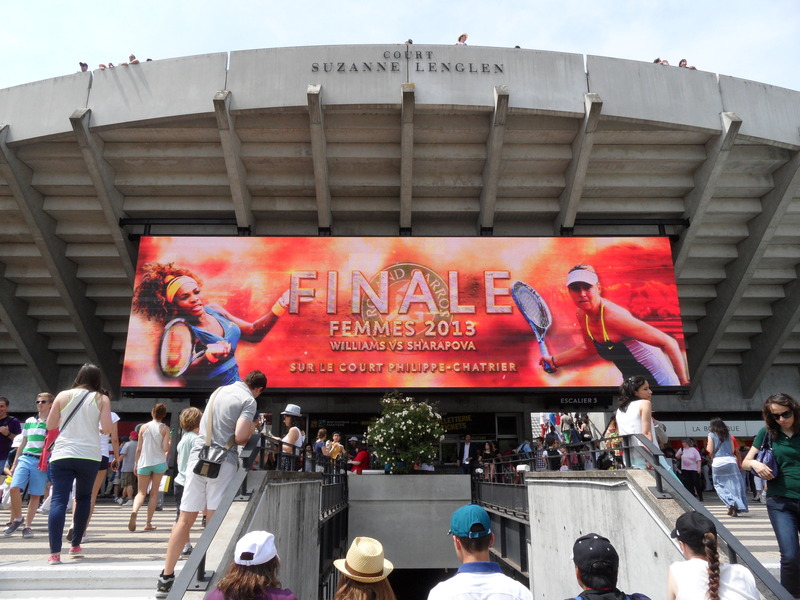 That afternoon, Serena Williams and Maria Sharapova faced off in the Women’s Singles Final. My friends and I got a nice spot to watch the match on a large viewing screen on the side of Court two. We had great seats, but they were under no shade whatsoever. The sun was brutal. Luckily, a hat, sunglasses, and some Häagen Dazs ice cream fixed that! 🙂 Serena emerged victorious (Go USA!) and we said au revoir to the Roland Garros. That evening and night, we went to the Arc de Triomphe and the Eiffel Tower. Both were spectacular and crowded, as one might expect. What was really cool about the Arc de Triomphe was actually quite situational; a military ceremony was going on underneath the arch when we visited. 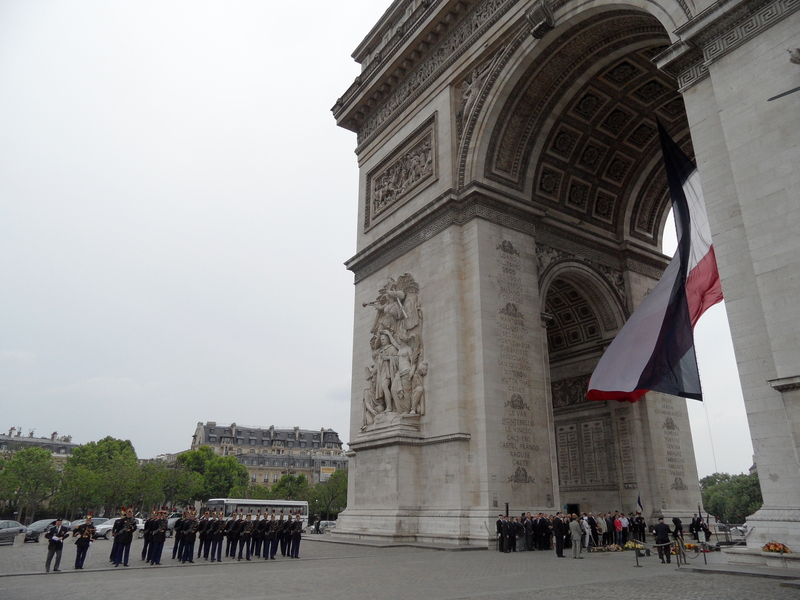 There were a lot of people that looked really important, as well as a French military band that marched past. It was neat to experience some pomp and circumstance celebration in a different country. 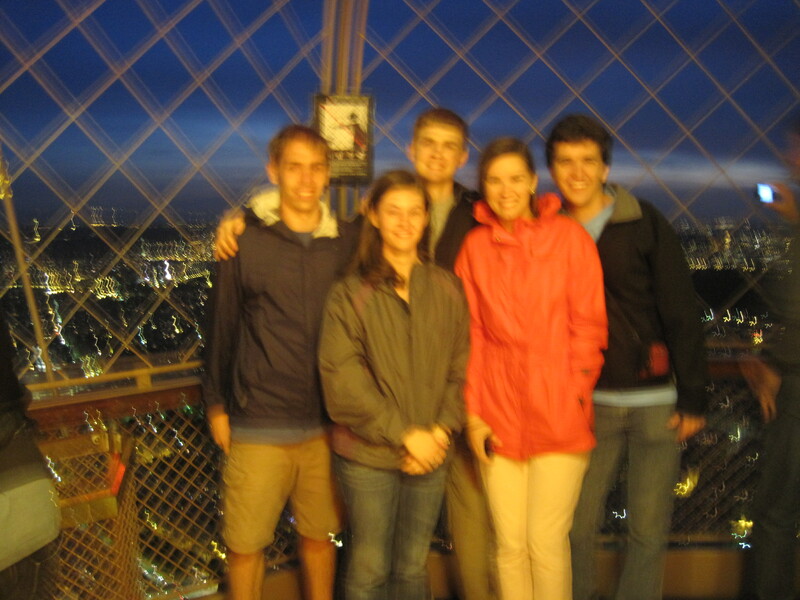 The Eiffel tower stood proudly over Paris in all its glory when we visited that night. Once we finally made it to the base of the tower (after stopping every two feet to take pictures during our approach), we bought some tickets to make the trek up to the second platform. “We can climb the Eiffel Tower, no sweat!” Right.. 710 stairs later, we caught our breath at the second platform of the tower and soaked in the view of Paris at night. It was gorgeous. Breathtaking (and not just because we were winded from the climb). It was so cool to be so high, on a man-made wonder, staring out over a beautiful city. That’s my humble opinion.. I thought it was awesome! 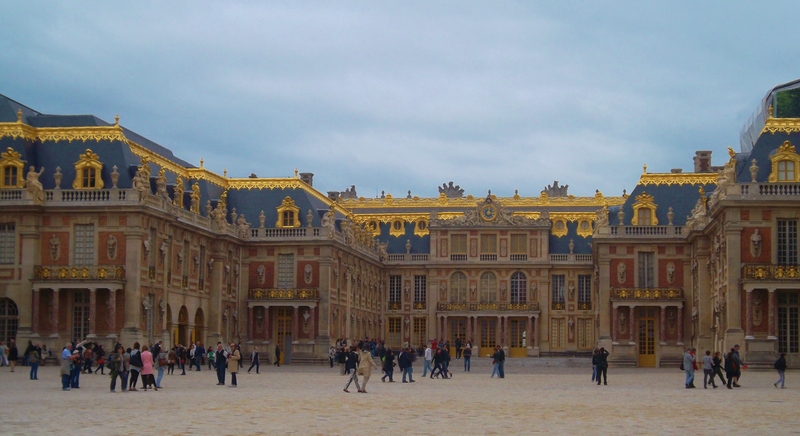 The next morning, we went to the Palace of Versailles. The palace was beautiful, but I can only say that for the exterior, for we decided to only get passes to the gardens of Versailles behind the palace (although I’m assuming that interior was equally as spectacular). It was overcast that Sunday, but that didn’t stop my friends and I from having a blast. 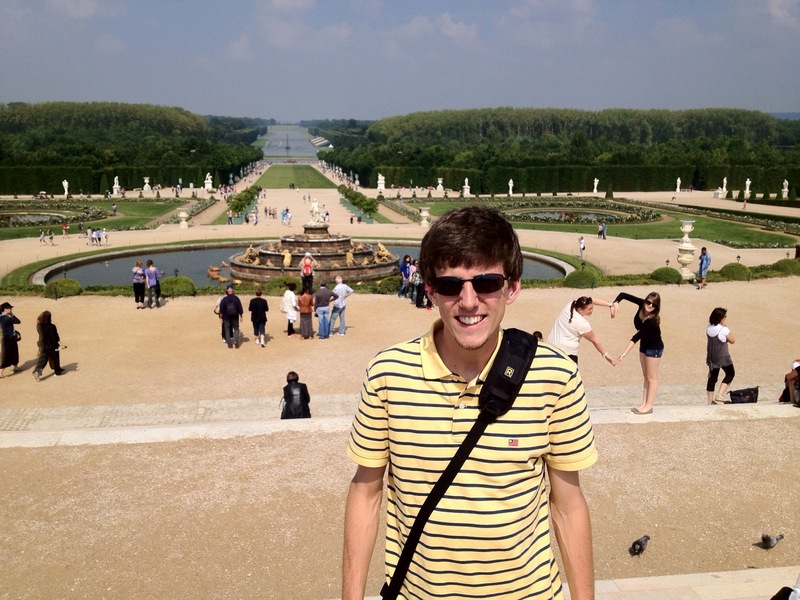 We walked around the gardens all day, checking out statues, fountains, and rows upon rows of precisely trimmed hedges. There wasn’t really much more to that day or trip. 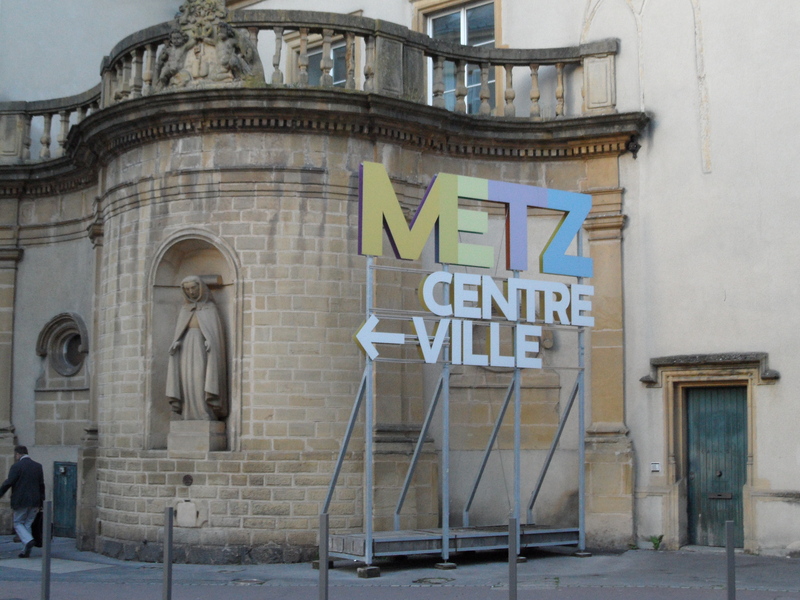 We just had fun in the gardens, hanging out and sharing plenty of laughs, then headed back home to Metz. I’d say the weekend was a success! 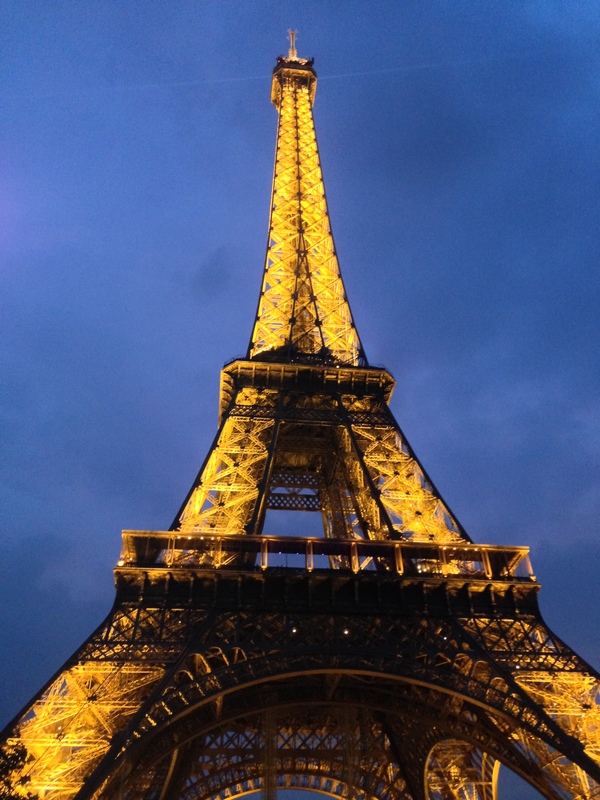 My second visit to Paris was July 13th – 15th. I went with a different group of friends this time and had a blast yet again. Some of our sightseeing overlapped from my first trip (I won’t harp on that), but we did see new things too, such as Notre Dame, Sacré Cœur, and the Louvre. 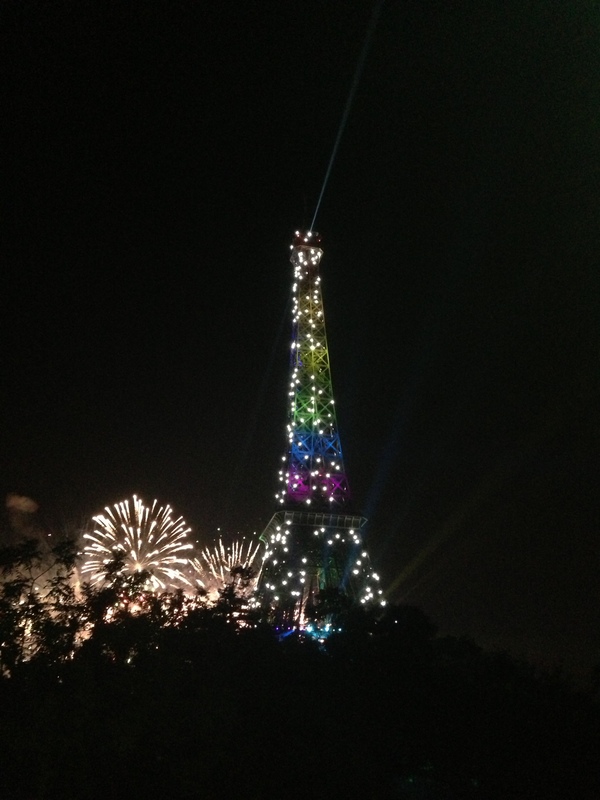 Also, we were there on Bastille Day, France’s day of Independence, so there was an awesome fireworks display behind the Eiffel Tower that Sunday night. Notre Dame was neat. We didn’t actually go inside or go up it (the line was way too long), but we did walk around it enough to appreciate and take in its awesome architecture. This year marks the 850 year anniversary of Notre Dame, and to commemorate the occasion, large viewing stands were erected in the square outside the front of the cathedral. That was the main difference I saw between now and the time I visited 4 years ago during high school. There were much fewer gypsies around begging for money this year as well. 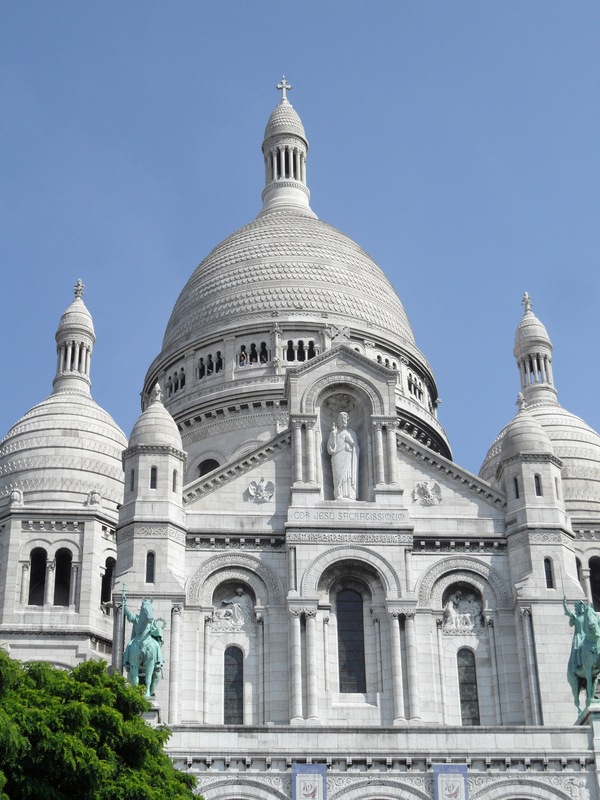 The Sacré Cœur is yet another breathtaking church in Paris, albeit on a hill overlooking the city. It was also neat to visit on a Sunday because Mass was in session when walked around the perimeter of the church (on the inside). This evoked a more authentic experience in a typically tourism-infested area, for which I was greatly appreciative. After checking out the church, we grabbed lunch in the artist district of Montmartre. Although expensive, the food was delicious and filling. The Parc du Champ de Mars, the park extending out from the bottom of the Eiffel Tower, was literally packed full of people Sunday night for the fireworks show. My friends and I got as close to the center as we could, but even so, the trees somewhat blocked our view. The show was great, but our viewing angle diminished the quality a bit, in my opinion. Also, the French didn’t seem too enthusiastic about their independence. The reactions were very subdued, even to the fireworks show. There was a very interesting music selection for the show, the most counterintuitive being “Living in America” by James Brown. The next morning, we all went to the Louvre. The giant museum was neat, much more so than the last time I visited during high school. I felt like I appreciated the art a lot more this time around, what with being older and having learned more in school. Notable works we saw in the Louvre were Hammurabi’s Code, an Easter Island Head, Nike (Winged Victory), and of course, the Mona Lisa. Paris is a great city. It’s the heart of France and one of Europe’s staple cities. 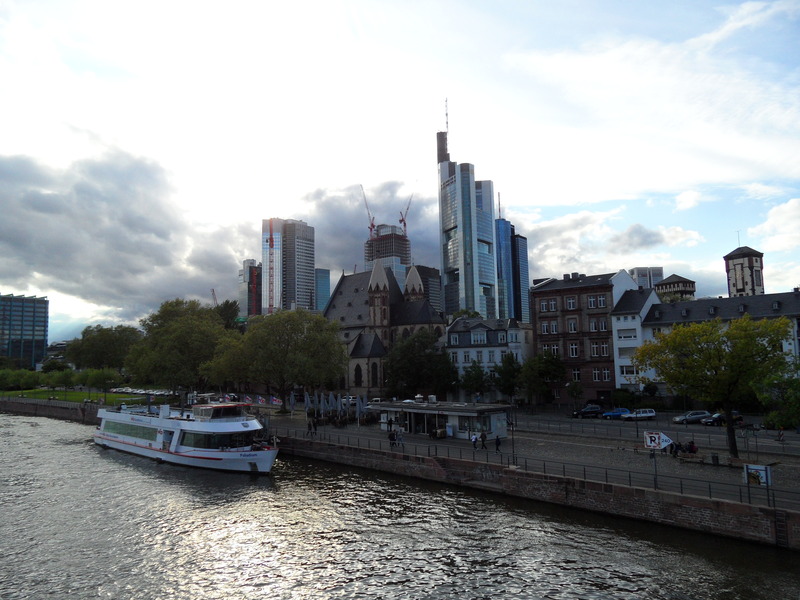 I loved my two visits to the city and hope to visit again at some point in the future! 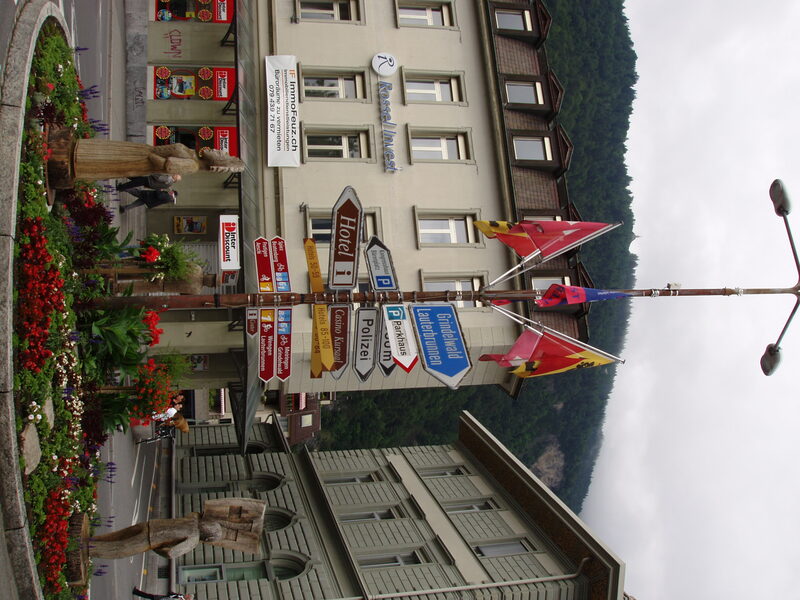 Posted by tsteindorf in Travel Log. Yep, looks like we were photoshopped, but no, we were actually there. Be jealous. So Friday we got into to Paris around 10, and after checking into our hostel we went to find our friend Ralf’s show. For those of you who don’t know, Ralf Popescu is a seriously talented and impressive electronic producer, so much so that he has been signed by AM Only (aka on the same level as Skrillex). He was playing a show at Le Red Light, so we were able to meet up with him and other friends from the Barcelona program. It was so much fun, and great to see him. The next morning we started off with some fresh fruit at a market, and then breakfasted on the lawn near the Eiffel Tower. It was so gorgeous, and of course we had fun taking pictures. Then we headed off to Louvre to try and meet up with other friends. However, we soon realized that saying, “Let’s meet at the Louvre” was about as descriptive as “Let’s meet at Georgia Tech,” and we actually didn’t get to see them. Instead we got lunch, then headed to Notre Dame followed by the Arc de Triomphe. We had a DELICIOUS dinner at a place called the Bellagio, and then headed back to our hotel (there was a little mix up that had us walking 20 minutes across town to a different hotel, but at that point we were just tired and ended up going to sleep). The next morning we visited Versailles. We ended up not touring the Chateau because of a massive line, but instead toured the gardens, which was quite fun despite how overcast it was. We were greeted by several baby swans, ducks, and surprisingly affectionate fish at the lake, and then headed home. I think this was a very relaxed weekend, and we needed it; with all the traveling we have been doing, we are getting really tired. Case in point, I think I turned my alarm off in my sleep this morning, and woke up at 8:05 (made it to my 8:15 class by 8:17, I was pretty proud of myself). 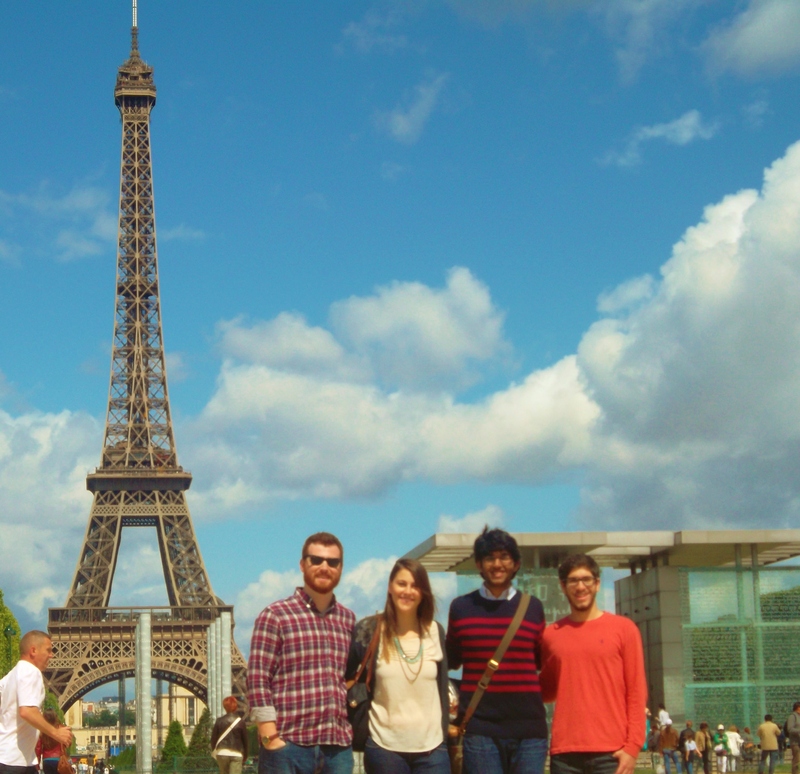 After Belgium, our tour group made its way to Paris for a few days. Our ride in was one of the most exciting experiences of my life. Our adept coach driver, Baloo, decided to take us and the bus on a tour through the streets of Paris. And what trip would be complete without a visit to the Arc d’Triumph? Now, anyone who is mildly familiar with the asphalt–for it would be incorrect to presume there is enough automobile organization for it to be called a road–surrounding the arch, knows that it is the equivalent of an eight-laned-without-lanes roundabout. As we plunged straight toward the center of the roundabout, Baloo narrated with the mic in his broken, heavily accented English, “Okay, everybody, close your eyes like me. It’s scary.” We took two very terrifying loops around the arch before maneuvering our way to safety and on toward our hotel. 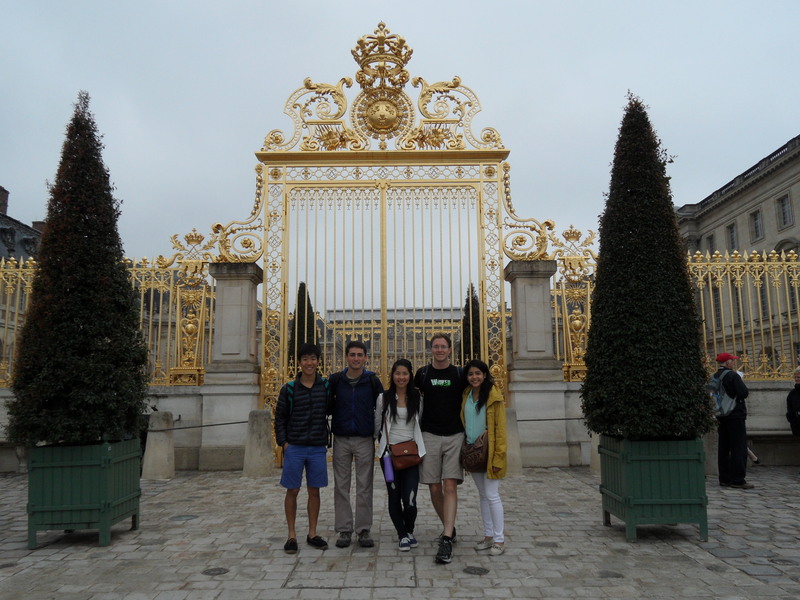 The first full day in Paris, we rode out to the Palace of Versailles. The building was incredibly impressive and imposing. I was struck by the vast number of rooms in the palace. The tour only included a very small portion of the interior. 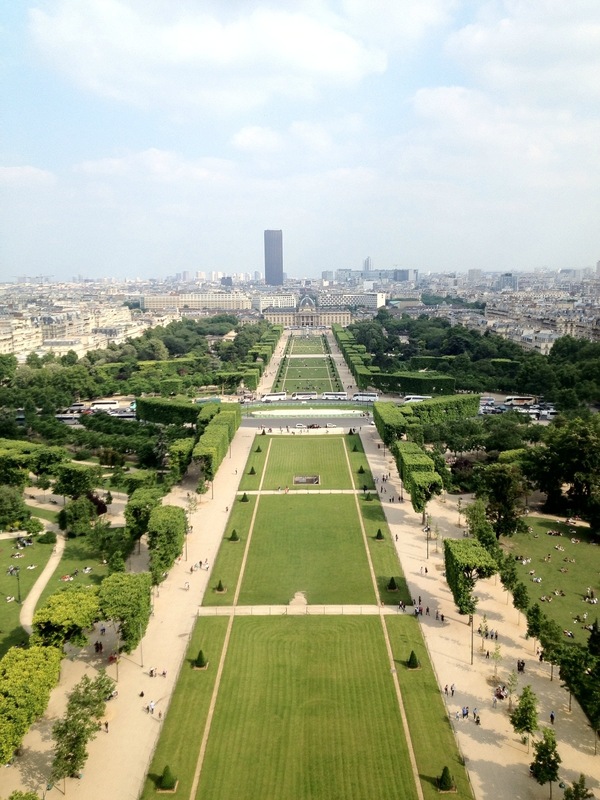 What I enjoyed more than the palace, was the gardens that stretched out behind it. The gardens included a massive grand canal, beautiful terracing, and lovely greenery. Unfortunately, we didn’t have much time to wander around the gardens, though I would have loved to. One of the best experiences from Paris was climbing the Eiffel Tower. 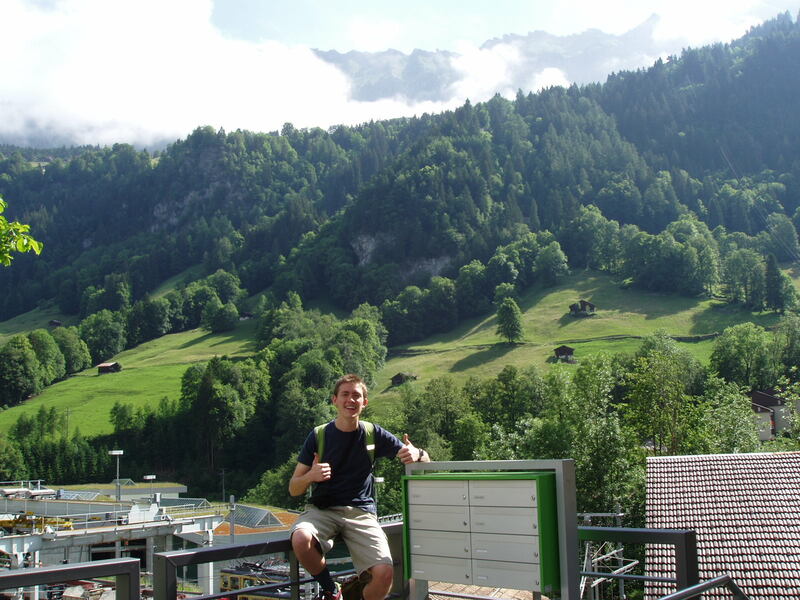 While most people were waiting in line to ride the elevator to the top, we decided to climb as far as we were allowed on the stairs and take the elevator the rest of the way. The view from the tower is incredible; we could get a 360 degree view of the city. While most everyone was very happy to be visiting Paris for its various charms and attractions, that was slightly overshadowed by the an ominous evil. What, you may ask, was this evil? The bane of the academic experience at Tech: finals. However, being accomplished and well-learned students, we were aware of the best remedy for such trials: cramming. No test would get in the way of enjoying Paris. Anyway, the night after our final, our last in Paris, most of the group decided to visit the Eiffel Tower again to enjoy the light of the tower when it lit up. It was really spectacular to see at night. On the second weekend of the summer, I went to Paris and saw quite a bit. I can honestly say that our weekend in Paris is the only one that left me physically exhausted. We started the weekend off by going to the palace at Versailles, which is truly the most impressive hunting lodge in world. Starting in Versailles, we got our first introduction to the crowds of Paris, though none of the crowds for the remainder of the trip came close to matching the mob of Versailles. Back in the city that day, we met up with the rest of our group at the Arc de Triomphe, though sadly the workers at the Arc were on strike all weekend, so we were unable to go to the top of the Arc. Our next day in Paris consisted going to see Notre Dame, the Louvre, walking along the Champs-Elysees, and going to the top of the Eiffel Tower. I was so exhausted that second day that I feel asleep standing up on the metro for several minutes. After waiting in line at the Eiffel Tower for several hours, we timed it perfectly to arrive at the top right at sunset, though I was on the wrong side of the tower when it actually set. At the very top of the tower, I learned that a good measure for how cold you are is how easily you can take a steady photograph. I was unable to do so, and so was the person that took a group photo for us. Our last day in Paris consisted of visiting Montmartre and Sacre-Coeur and the catacombs. Well, these blog posts have been a long time coming and just never happened for one reason or another, but here goes, starting from the beginning. 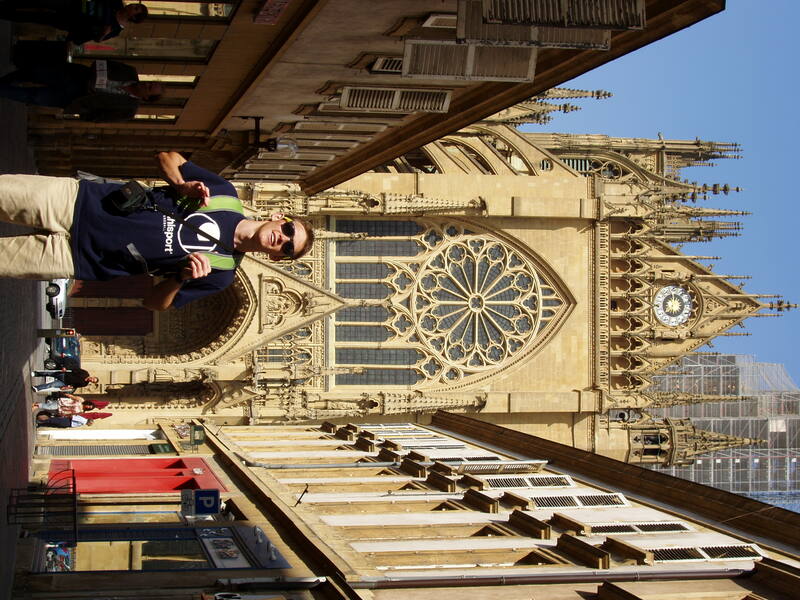 My very first week in France, only a few days in the country, I had the “pleasure” of experiencing one of the many European social differences, the commonality of pickpockets. I had just left the GTL building after classes and was walking back to my dorm when a French guy, no more than 2-3 years older than me, approached me asking for help because his phone had died. He continued to bother me as I insisted that I could not help him, and he eventually stole my iPod from pocket. I’m not quite sure how he did it, especially since I felt as though he had dubious intentions in the first place when he approached me and was on guard. After that, he ran off, and I gave chase. I chased him down the road, through a patch of bushes, and across the street for about 100 meters before I was able to tackle him to the ground. I picked up my iPod from the ground and walked off, not wanting to escalate the situation any further. The next day, I went to the local police station and filed a report, and other than congratulating me, the only words the police officer had for me were “Welcome to France.” Unlike how most people would respond, I honestly enjoyed the chase and excitement, and if it hadn’t happened, I wouldn’t have two of my favorite souvenirs: a French police report and an awesome story. 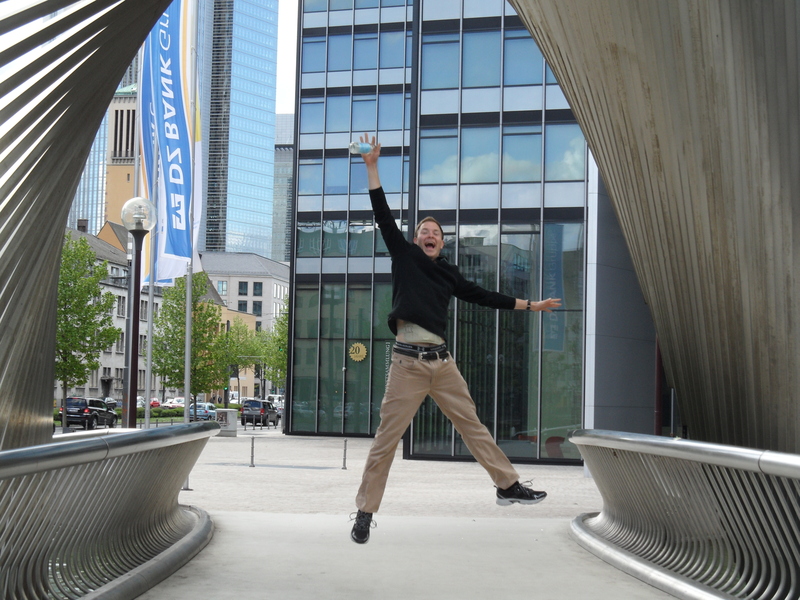 I have no photos of the incident or where it occurred, so here’s a picture from my first weekend in Luxembourg. Bonjour, people. Paris holds the distinct honor on our trip of being the city in which we spent the most consecutive days (except, of course, Oxford, which doesn’t really count because that’s not really the travel portion of our trip), which, given the accommodations, was most certainly not the brightest idea in the world. That aside, it turns out that Paris is a pretty interesting city. Getting to Paris ranks among the less desirable parts of the trip. After 14 hours on a bus (and in departure of Prague, no less), I came to the conclusion that ground-based transcontinental transportation is not my cup of tea. 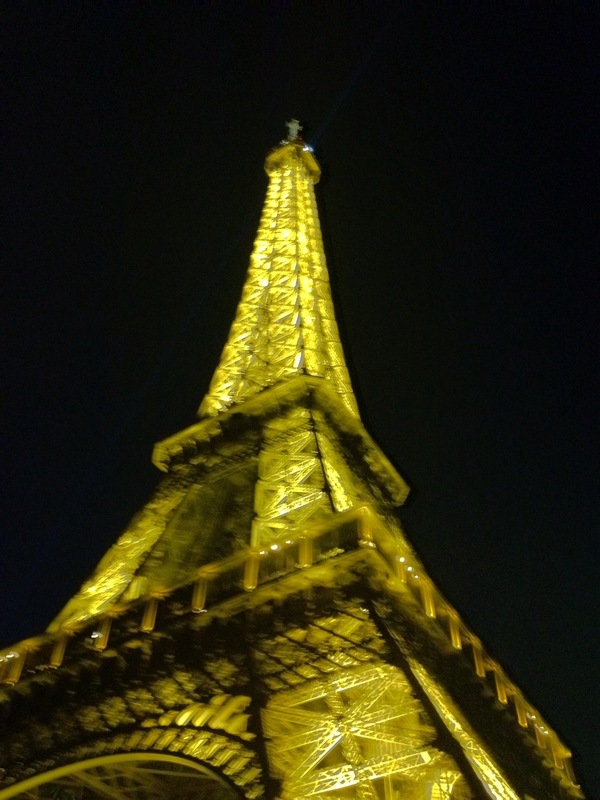 Nevertheless, since every cloud has a silver, faux-silver, or off-silver lining, we were treated to a nighttime view of the city of Paris and the Eiffel Tower as we rode into the city. On our first day in Paris, we took a class trip to the Musee d’Orsay, a museum specializing in Impressionist and Realist art. Since I am not particularly enamored with either of those styles (I like Surrealism, Cubism, and ancient art), I found much more interesting my travel to and from the museum. Not willing to spend money on the faster, more convenient underground transportation and also wanting to see more of Paris, I traveled on foot to the d’Orsay. 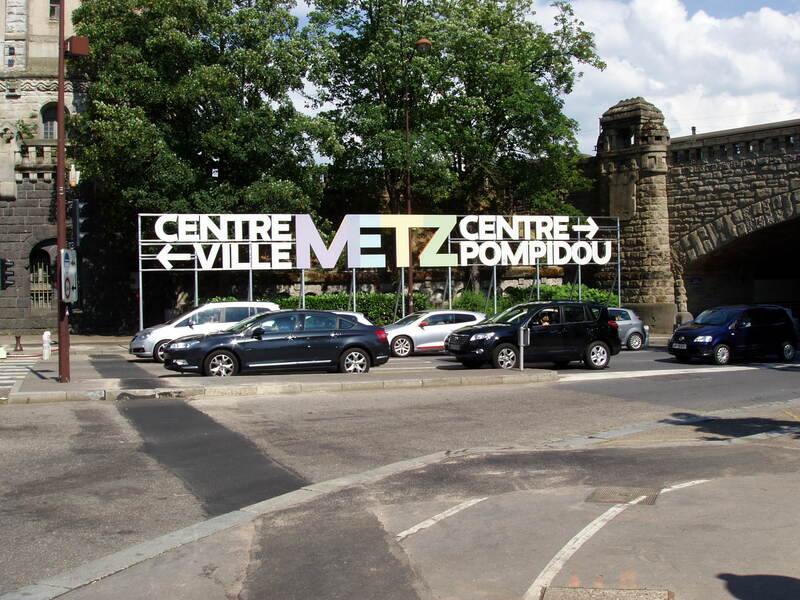 Along the way, I found the French Military Museum, most notable for housing the magnificent tomb of Napolean. I really wanted to see this, but there was an entrance fee, and it would not have been a wise use of my time since I had to rendezvous with the rest of the class at the museum at a certain time. It was here that I got my first good glimpse at the Eiffel Tower and the Seine. On the return from the d’Orsay, I decided to walk the entirety of the legendary Avenue des Champs-Élysées, which was a bit more of a task than I had expected. 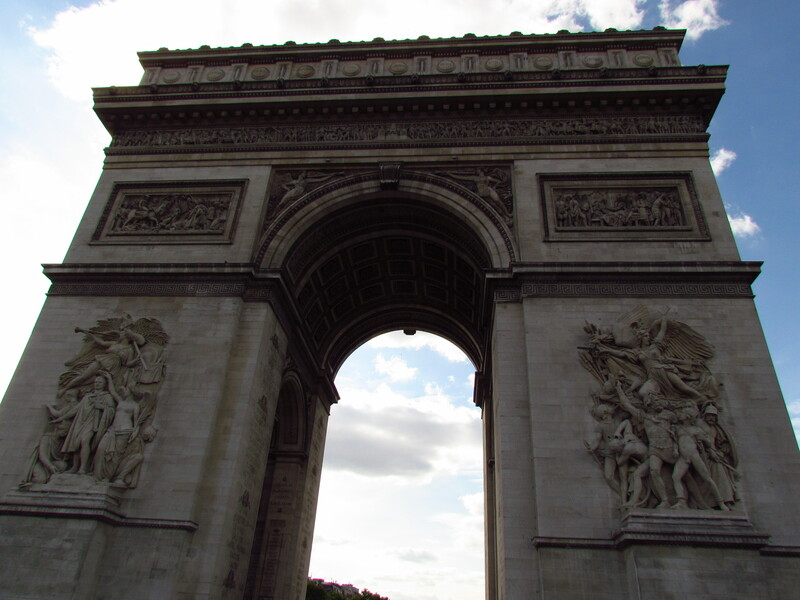 Starting at the Louvre end, I pushed my way through huge throngs of people toward the Arc de Triomphe. Along the way, I had a run-in with a Georgia Tech graduate who was on vacation that week. A bit later, I found myself at the end of the Champs where the Arc de Triomphe stands in the middle of what must qualify as the world’s most absurd roundabout. It turns out you have to walk underground to get to the Arc, which is a good thing, because there’s no way anybody could ever cross on level without getting hit by at least 50 cars. If pedestrian travel around the Arc was a video game, and getting there was novice difficulty, getting away would be classifiably mythic. There are no fewer than eight roads feeding into this nightmarish roundabout, and the one I needed to take to walk to the Eiffel tower necessitated crossing the most number of these feeder roads. I must stress that despite the fact the Eiffel Tower looks just like a pile of metal trusses, it is truly magnificent when standing beneath. The shear enormity of the structure is awe-inspiring. For those curious and not, I did not shell out the steep asking price to ascend to the top of the tower. 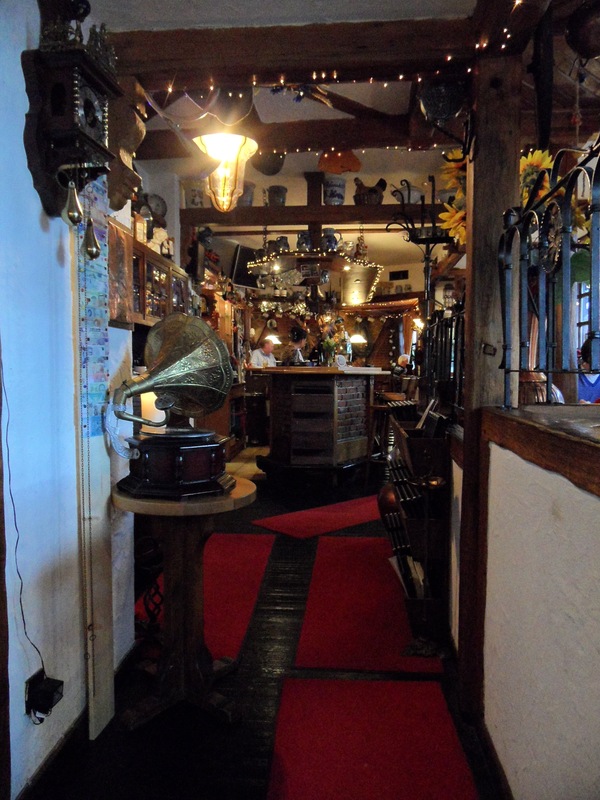 Later that night, our music class went to a jazz club, which was interesting, but irksome to get to and from after dark. 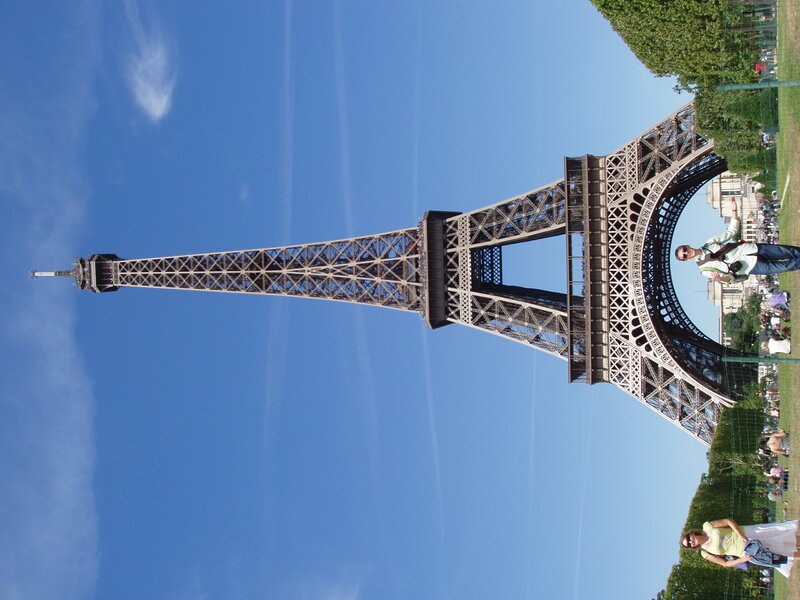 Because what else to you take pictures of in Paris? 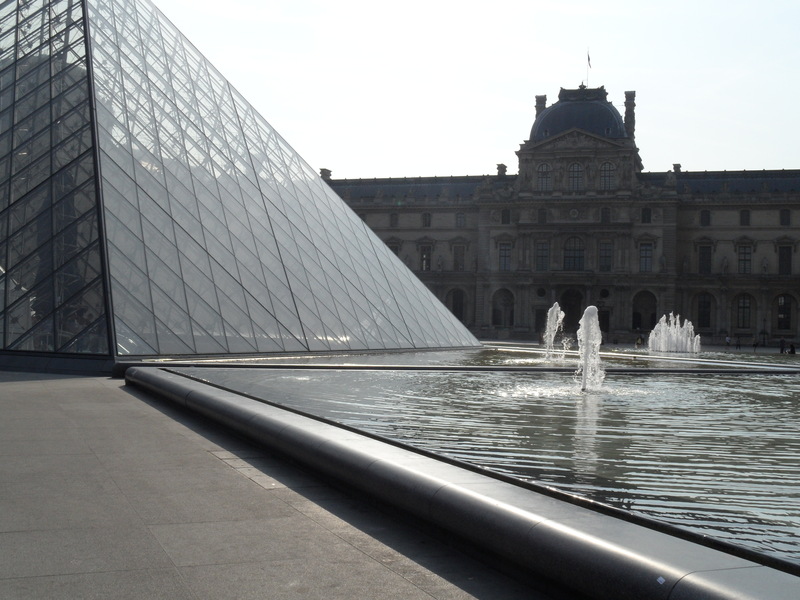 The second day in Paris was dedicated solely to the Louvre. When one considers the amount of work in the Louvre, it is easy to understand why we would spend the whole day there. You may be happy or sad to note that I got my tacky tourist picture of the Mona Lisa. I’m not including it in this post, because it really won’t add any value, and it isn’t difficult to find nearly identical pictures elsewhere. The museum was enjoyable but tiring, and as it is just another museum with lots of art in it, I will leave it at that. 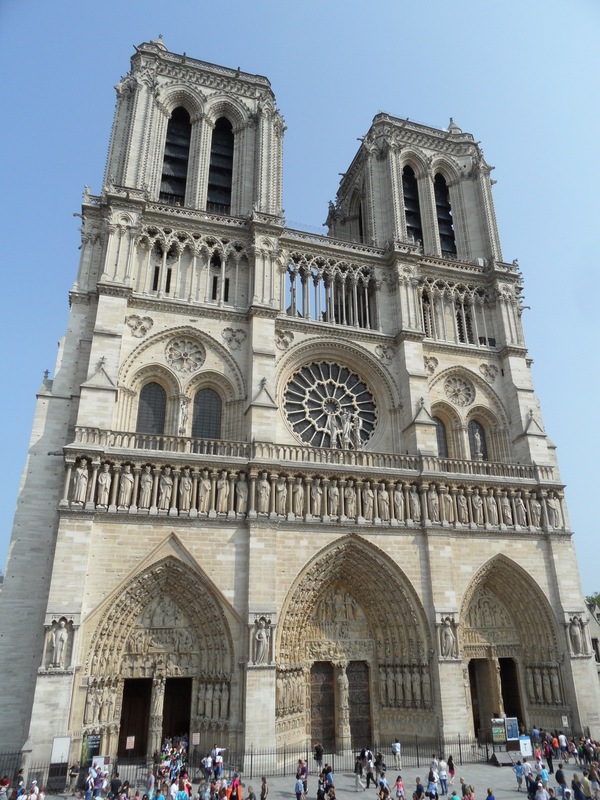 On our way back from the Louvre, we stopped by Notre Dame, the famous Gothic cathedral where we were unable to locate any hunchbacks, whatever those are. 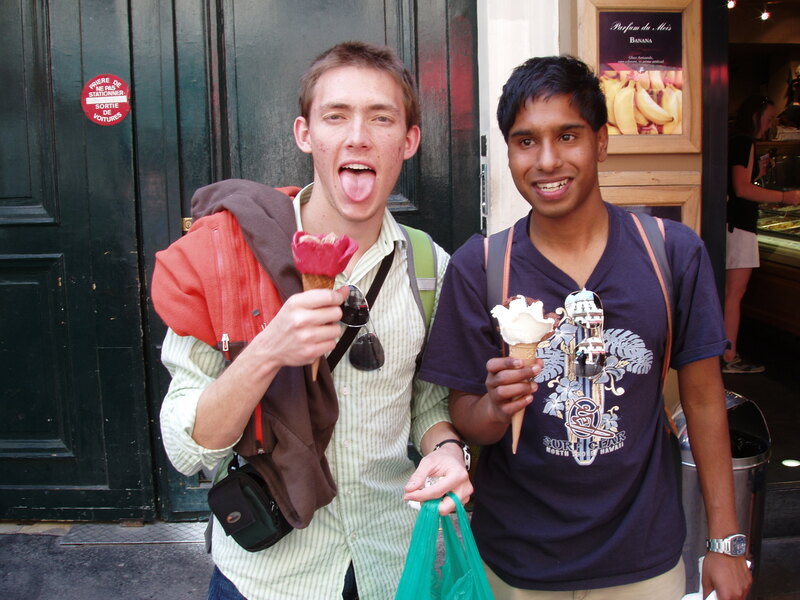 The third day in Paris, Sunday, June 26, was a completely free day where we could do whatever we wanted. 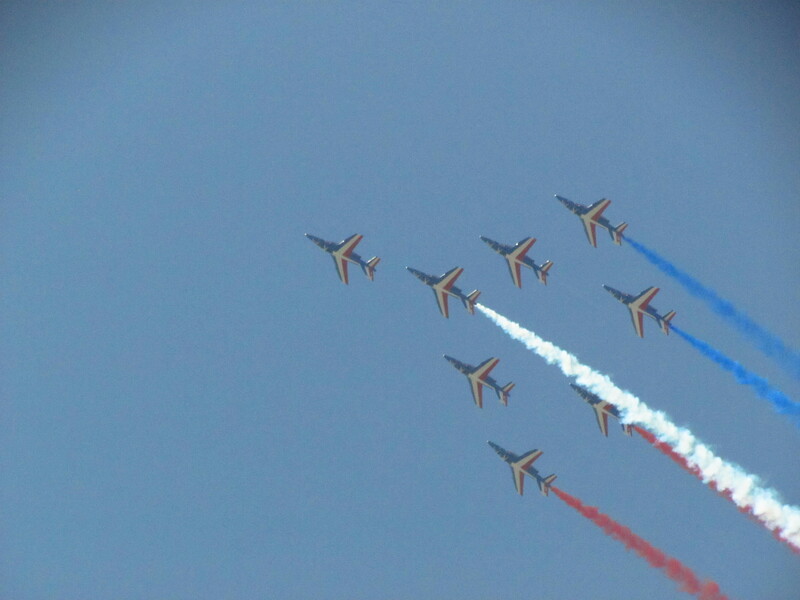 For me, that was the Paris Air Show. That Sunday just happened to be the last day of the biannual Paris Air Show, and I, an aerospace engineer, had a 100% free day to attend. Talk about exciting. Tickets were €13 apiece, but I would argue they were worth a lot more than that. I would have gone out to the airfield (which was on the opposite side of Paris in relation to our hotel) first thing in the morning, but I had to pick up my ticket, which was only obtainable at one store on the Champs that didn’t open until noon that day. On top of that, the bus that stopped at the air show got stuck in the horrendous traffic of like-minded aerospace enthusiasts. The air show was fantastic in every way from the vendor displays (vendor, as in airplane salespeople, not popcorn salespeople) to the static aircraft displays to the live aerial demonstrations. They even had an ESA (European Space Agency) hangar and a couple rockets, including the Ariane V, on display. It follows, thus, that I was very disappointed when the time came to leave. Our last day in Paris was given to a tour of the opera house, which was very similar to our excursion in Vienna, and the Pompidou museum, which is dedicated to modern art. By this point, we were all starting to get a bit tired of Paris and were ready to move on. 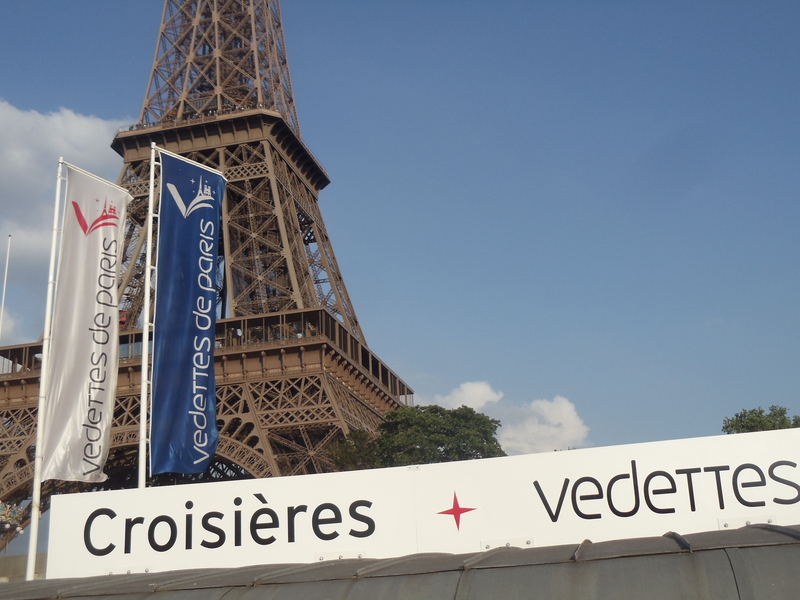 Paris was a lovely segment of our trip, and the Paris Air Show was definitely my favorite part. 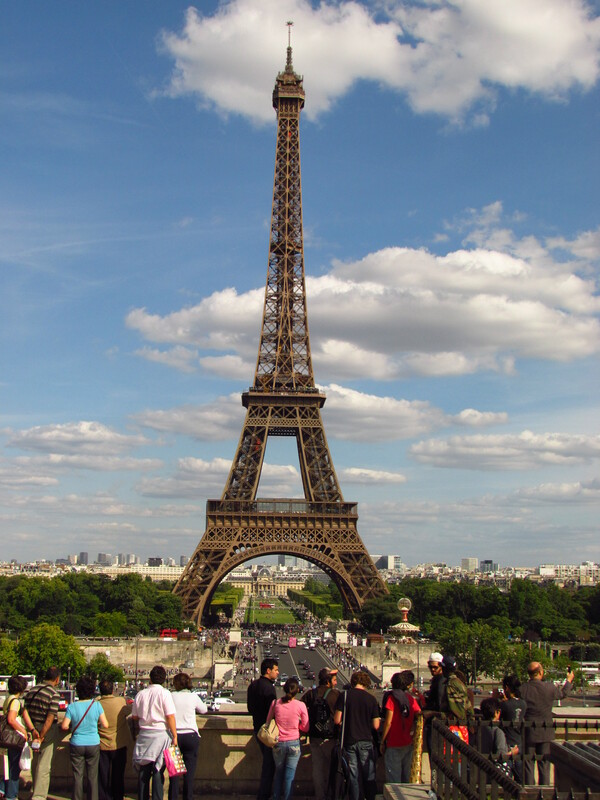 Going into the trip, I didn’t think I would like Paris so much, but I was pleasantly surprised, and I even left myself more things to do if I go back. Posted by Steffan Slater in Travel Log. This was quite the action-packed week this past week. On Wednesday was our first GTL field trip. We visited the Lorraine American Cemetery in Saint-Avold and the Hackenberg Fortress, part of the Maginot Line. The cemetery was very impressive and yet another strong reminder of the less pleasant parts of Europe’s recent history. The Hackenberg fortress was also a reminder of European history in that time period, but not as vividly. I really think that it is fantastic that GTL puts does these trips (there are two total) for the students, as it lets us see nearby things which we might not get to see otherwise. We also had a fantastic lunch at a local restaurant paid for by our program fees. The evening after our field trip, the first lunar eclipse of 2011 occurred, and it was visible from Europe (although not from the United States). Unfortunately clouds blocked the view of the moon for quite some time, but eventually it was visible. It didn’t become visible until after the totality of the eclipse had passed, though, so we got a view of the moon as it came out of the Earth’s shadow. This was a very interesting eclipse because it was the longest one in quite some time (100 minutes of totality) as well as one of the darkest: typically the moon turns reddish during an eclipse, but during this one it was more or less black. 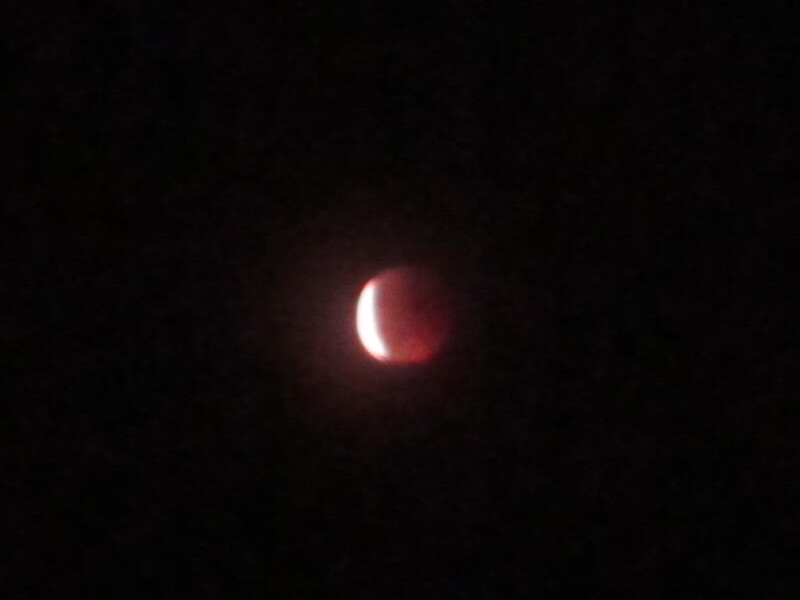 I did get some pictures; they’re not very clear but they look pretty cool since I captured the moon as it was coming out of the shadow. At 8:45 I caught a bus out to the main attraction for the day, Pont du Gard. Pont du Gard is a massive Roman aqueduct bridge spanning a valley. 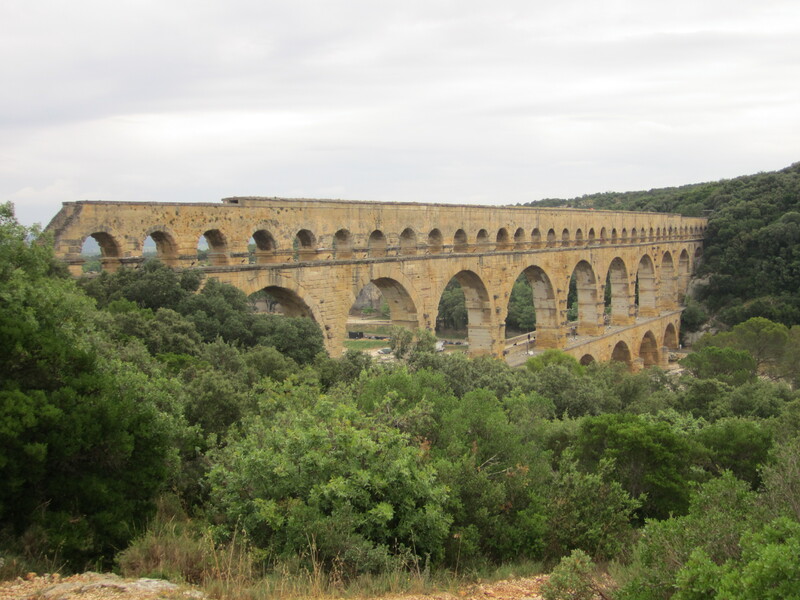 The aqueduct was built to take water to the town of Nîmes and was 30 miles long. Incredibly, the vertical distance traveled by the water from the source to Nîmes was only 56 feet! Most of the aqueduct is at ground level or below it, but at Pont du Gard it has to cross the deep river valley, leading to the second tallest Roman structure still standing today. There are a lot of visitors, but the site is surprisingly peaceful, as you have to walk for a couple minutes to get from the entrance to the actual site. The aqueduct is of course extremely impressive, and there are a large number of trails on the adjacent hills which allow for great views of the site. I was at Pont du Gard for about 4 hours. Unfortunately I did not get to do two of the activities I was interested in doing at the site, canoeing under it on the river and hiking along the water channel on top. The weather was not very good for canoeing (it was overcast and not very warm) and the tours on top only run in July and August. The visit was wonderful despite those issues though. I caught a bus back to Avignon and visited the Pont Saint-Bénezet, the famous bridge of Avignon. Less than 20% of the bridge’s original length remains today, but it is still pretty cool to visit and the museum associated with it has some interesting displays about bridges, including some very impressive modern ones. 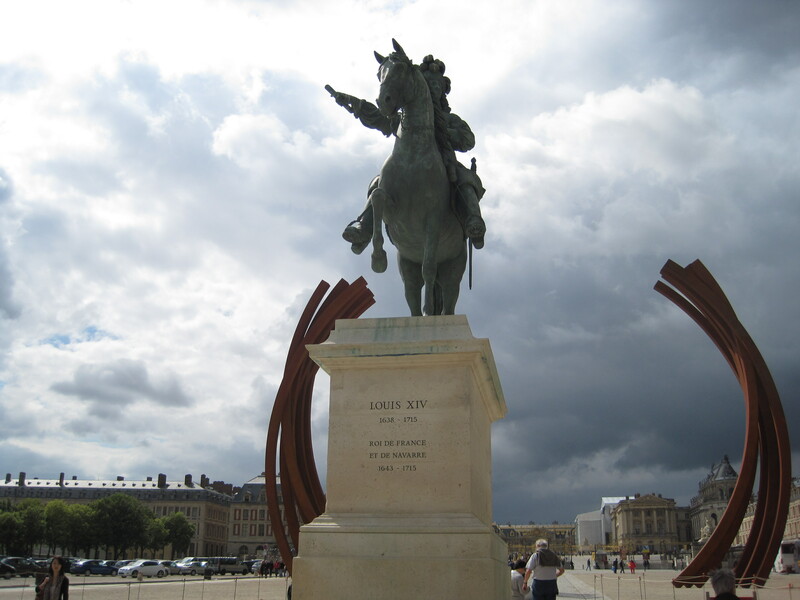 After that, I took a 20 minute train ride to the town of Arles. 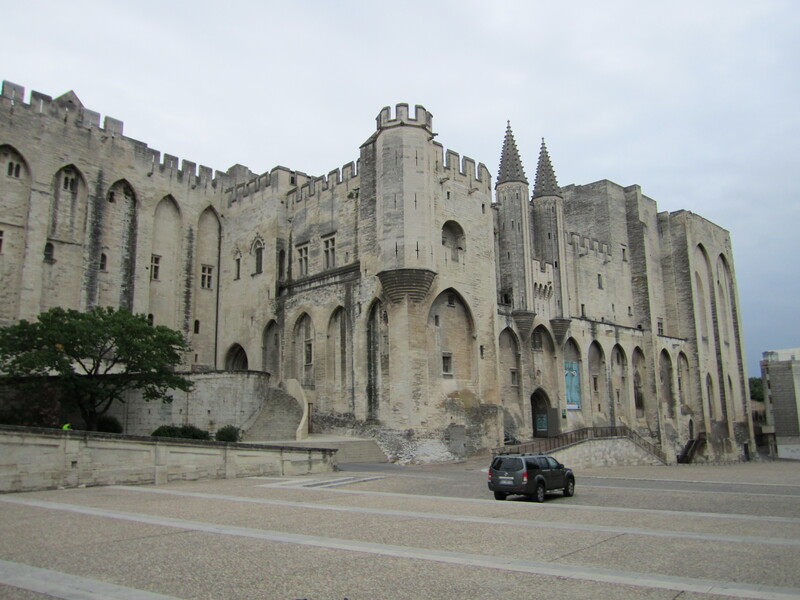 Arles is another medieval city (also with walls still standing), although it is much smaller than Avignon. 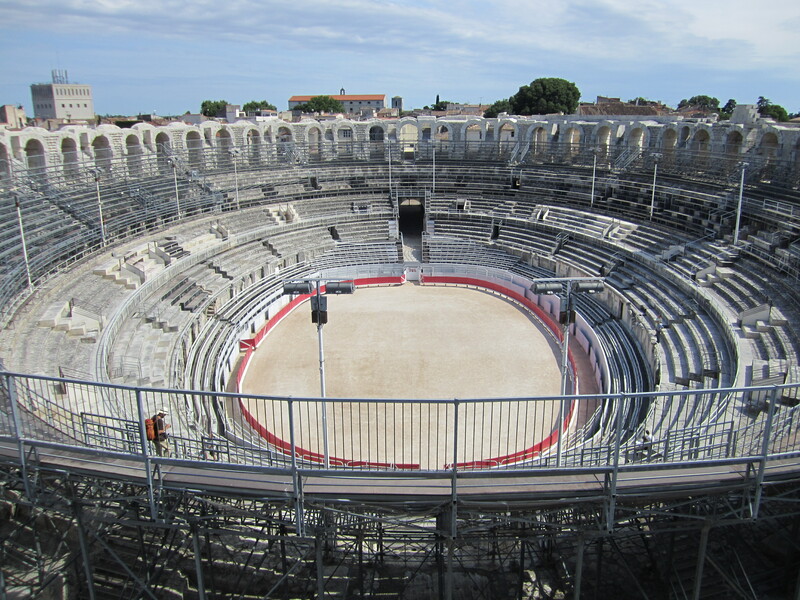 The primary attraction in Arles is the very well preserved Roman amphitheater. For 4.50 Euros you can go in and walk around the entire structure. One of the really interesting things about this amphitheater is that during the Middle Ages, the arches were bricked off and some towers constructed on it, and it was used as a housing area. Three of the towers still stand, and by climbing one of them you can get some good views of the city and the amphitheater. In this picture you can also clearly see that there are metal bleacher-style seats in the amphitheater. It turns out that this arena is still used! There are bullgames, which are non-violent affairs, as well as traditional bullfights hosted throughout the year. And from July through September there are reenactment gladiator fights on Tuesdays and Thursdays! I’m really considering going back down to see one later in the summer if I can. I mean, how often do you get to see a gladiator fight in a real Roman amphitheater? After Arles I was on my way to Cannes, home of the international film festival and beaches. My train ride there took me through Marseille, which struck me as kind of a sketchy city. 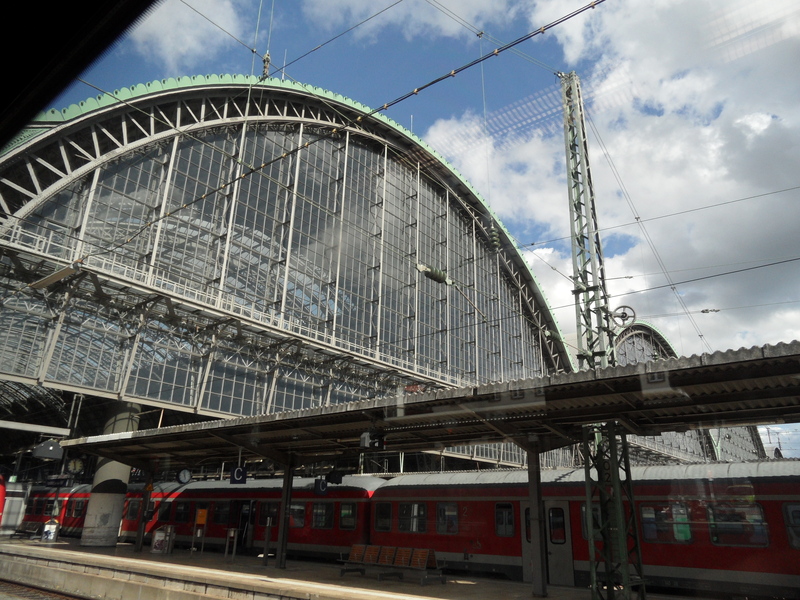 I spent my layover there near the train station, especially since I didn’t really have any information about it anyway. The next day was spent in Cannes. I spent the morning on the beach, but a couple hours was enough for me. I’m not really a beach person. In the afternoon I hopped on a boat out to the nearby island of Sainte-Marguerite and spent a few hours exploring it. There was a small fortress and prison there, which is what the island is known for. The prison once held the infamous Man in the Iron Mask. Most of the island is wooded and crisscrossed by trails, so I spent a good deal of time walking around the island after seeing the prison. All in all, this was a very, very enjoyable weekend. Seeing the Roman structures has me very excited for next weekend, when I go to Italy!